Dr. David C. Weindorf is the Associate Dean for Research in the College of Agricultural Sciences and Natural Resources, as well as Professor and BL Allen Endowed Chair of Pedology in the Department of Plant and Soil Science at Texas Tech University. He received his B.S. in Range Management, M.S. in Soil Science, and Ph.D. in Agronomy all from Texas Tech. David next accepted a faculty position at Tarleton State University, followed by a faculty position at Louisiana State University, before joining the faculty at Texas Tech. David is the recipient of numerous awards and honors including the Texas Tech Faculty International Scholarship Award, the USDA-NRCS National Cooperative Soil Survey’s Eagle Award, and a Fulbright Scholarship where he spent time at the University of Agricultural Sciences and Veterinary Medicine of ClujNapoca, Romania. He is also a member of the Soil Science Society of America and chair elect of the Pedology Section of the Soil Science Society of America. David is here with us today to tell us all about his journey through life and science. When his thoughts aren’t absorbed in science, David enjoys watching a good action movie, spending time with his two teenage children, being outdoors, hiking, watching NBA games, and playing basketball. As a soil scientist, David tries to understand the physical and chemical properties of soil, map the extent of different soils across landscapes, and organize soils into a classification system that allows for their optimal use. Soil is an incredibly important, but often under-appreciated, natural resource. David’s passion for natural resources and natural resource conservation started early. He fondly remembers spending time with his grandfather on the farm, and this made a big impact on him. His high school didn’t have an agricultural program, so he petitioned to be allowed to take classes at a different school in the afternoon. David also joined the Future Farmers of America, and he gained experience through raising a pig and chickens. The transition to college was difficult academically for David, and he worked hard under the guidance of excellent mentors to improve his study skills and academic performance. As a faculty member at Tarleton State University, David was denied tenure. This was a major disappointment after the six years of hard work that resulted in him graduating 7 successful Master’s students, receiving teaching evaluation scores in the top half of his department, bringing in over $1 million in grants, and publishing multiple peer-reviewed articles in great journals. He had one year to find a new job, and David felt like he had failed his students and his family. Last month, David was promoted to full professor. This represented the culmination of 15 years of work, and so many little wins contributed to this accomplishment. Another exciting success was the outcome of a project he worked on with a group of middle school students. David and the students discovered higher than EPA acceptable levels of heavy metals in the soils around local schools, and they published the results in peer-reviewed journals. Their story was featured on the news, one of the students was awarded second place at the state science fair, they were invited by the Secretary of Education to be recognized in Washington DC for doing real science in middle school, and one of the students was awarded first prize internationally in a science competition in Nairobi, Kenya. One of David’s absolute favorite places is Alaska, and he has been going there annually for 10 years. The places they go to collect soil samples are very secluded. He and his students work deep in the wilderness, hundreds of miles from anything else, and they are completely disconnected from email, internet, and phone. They head out to collect data equipped with bear spray, a survival pack, and their soil sampling gear. The conditions can sometimes be challenging, but the natural beauty in those pristine areas is breathtaking. Before each exam in his introductory soils course, David offers what is famously known as his basketball review session. Students of all levels of basketball skills report to the rec center to play basketball with him, and in between the games, David asks them practice test questions. He has even been known to break out some sidewalk chalk to draw elaborate diagrams when they are playing outside. Never give up in the face of adversity, and always remain humble and kind. Also, fortune favors the bold, so take chances, be unconventional, think outside the box, and always ask why. David has authored over 100 peer reviewed research manuscripts chiefly in the area of proximal soil sensing, land use management, and environmental quality assessment. He works extensively on international projects, with active research ongoing in Romania, Italy, Spain, China, India, and South Africa. David also serves as executive producer of an upcoming documentary film exploring the influence of climate change through the prism of arctic soils and ecosystems. 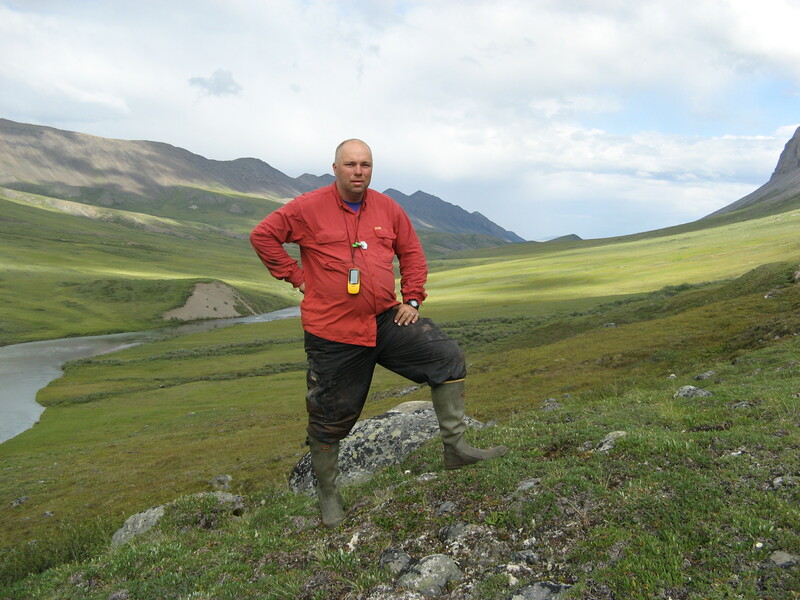 In the photo above, David is surveying soils near Atigun Pass, Brooks Range, Alaska. Away from work, David is a rabid San Antonio Spurs fan, loves playing basketball, hiking, and enjoying time with his wife (Whitney Jo), son (Walker), and daughter (Camille).